Get started using Blumats with our simple, low-cost Starter Kit. If you only have a few plants or you'd like to learn how Blumats work before converting over to a larger system, this kit is just right for you. This kit is made for a gravity-fed system (does not include fittings to attach to a hose bib or pressure system). 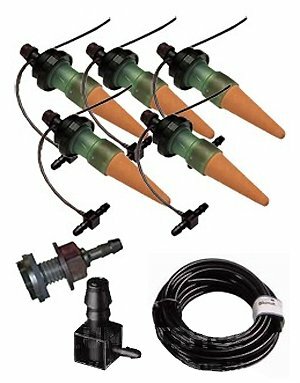 This Kit Includes: 5 Blumat carrots (5") A thru-the-hull adapter for attaching to a reservoir (reservoir not included) 3mm-to-8mm end piece 7 meters of 8mm Blumat tubing Increase your yields and decrease grow times. Our fully-automatic, self-watering systems save time, water, and nutrients - and still ensure healthier, more potent, and faster-growing crops. GET STARTED using Blumats with our simple, low-cost Starter Kit. If you only have a few plants or you'd like to learn how Blumats work before converting over to a larger system, this kit is just right for you. Includes 5 Tropf Blumat Plant Stakes, tubing, & accessories.